Vancouver, British Columbia--(Newsfile Corp. - November 6, 2018) - Sixty North Gold Mining Ltd. (CSE:SXTY) (FSE: 2F4) (OTCQB: SXNTF) (the "Company" or "Sixty North Gold") is pleased to announce that it has discovered a new, high-grade silver lead zinc massive sulphide horizon within mixed mafic to felsic volcanic rocks on its Mon Property. A 2,500 m long contact of mixed mafic and felsic tuffs referred to as the Nelson Lake Deposit hosts numerous structurally and stratigraphically controlled massive and disseminate sulphides and gossanous schist zones, containing pyrrhotite, pyrite, chalcopyrite, galena, and sphalerite and in places arsenopyrite together with associated oxides. 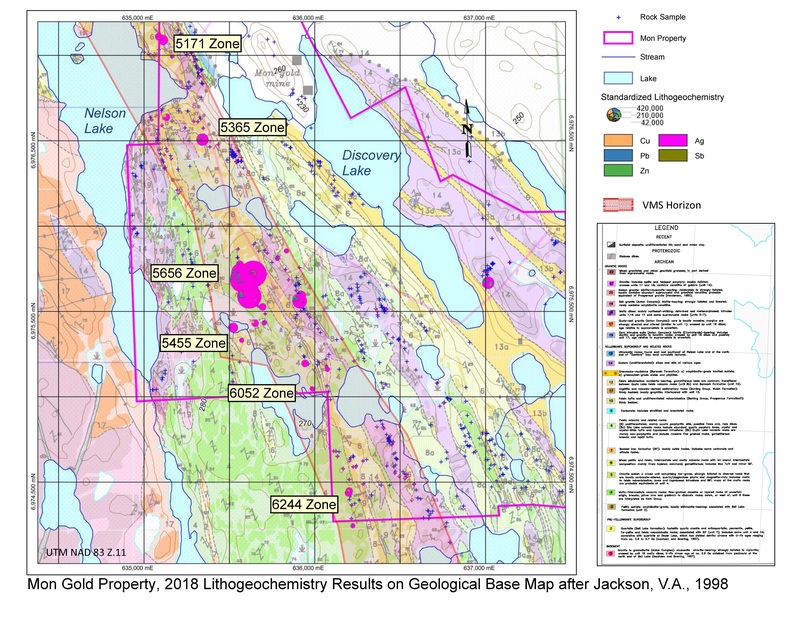 To date, six zones of significant base metal concentrations have been confirmed within the Nelson Lake Deposit by grab sampling. Readers are cautioned that grab samples are by their nature selective and are not necessarily indicative of the mineralization and general geology of the property. All Pb, Zn, Ag, and Sb are reported using MA270 and Au and Cd are determined by AQ251 procedures at Bureau Veritas (BVI) using AQ251 ICP analysis at their Vancouver Laboratory. A Dighem airborne magnetic and electromagnetic survey ("EM") completed by a previous operator in 1988 identified six weak to moderate conductors, 230 to 720 m long, half with a magnetic response along this horizon. The 5656 Zone and one other zone are in part coincident with these EM anomalies. The Company plans to complete a property-wide airborne geophysical survey as well as a focused ground geophysical survey on a grid to be cut over the 5656 Zone. Diamond drill contractors are being contacted to assist in planning a drill program to assess the 5656 Zone and other targets. John Campbell, Chairman of the Board of Directors reports, "This is an exciting new discovery representing focused prospecting by a dedicated team and represents a new target type on the property. Precious metals-rich VMS deposits can generally be assessed quickly and efficiently using common geophysical techniques, however the high lead and zinc relative to copper typically results in a lower conductivity response which attests to its only recent discovery." Dr. J. Franklin reports in "Volcanic-associated massive sulphide metals; in Geology of Canadian Mineral Deposits, 1996" that VMS deposits often occur in clusters along favourable horizons and in 2007 were reported to contribute 27% of Canada's Cu production, 49% of its Zn, 20% of its Pb, 40% of its Ag, and 3% of its Au (Galley et al., 2007). Campbell further notes that, "Many VMS deposits in the Northwest Territories are more silver-rich and copper-poor than the Canadian average with Sunrise Lake and Hackett River being notable examples. Conceptually we might expect a typical VMS target to average between nil to 3% copper, nil to 7% zinc, nil to 3% lead, nil to 4.0 gpt gold, and nil to 160 gpt silver and average between 3 to 9 million tonnes. We are pleased to have an additional prospect on our property that can be assessed in conjunction with our work on the previously discovered surface and underground gold zones. This further demonstrates the "Blue Sky" potential of a greenstone belt with significant high-grade past production of gold." Readers are cautioned that mineralization hosted on the other VMS deposits is not necessarily representative of the mineralization hosted on the Mon Property.